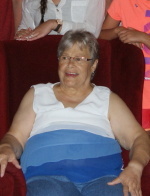 Doris Thibodeau Obituary - Haileybury, Ontario | Buffam Leveille Funeral Home Ltd.
Thibodeau, Doris Fabiola (Gingras) - An exceptional woman has passed away during the night of July 25, 2018. 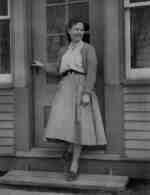 Born in Rollet, QC, Doris Gingras arrived from Arntfield to make her debut in Earlton by working in the general store owned by her parents, the late Alfred and Fabiola Gingras. She grew up with her brothers and her sister: Germain (Rolande), Denise (Sonny), Réginald (Diane), Yvan (Carole) and Jocelyn (Loraine). After marrying the late Jean-Claude Thibodeau whom she supported with his dairy farm, they raised their “6 beautiful children”, as she always said: Anne (André Robert); Luc, Denis (Joyce Boom), Lyne, Sylvie and Josée (Ian Auger). After selling the farm and that the children were almost ready to take on independent lives, she decided to return to school to get her grade 12 diploma. A dream come true for her. Doris’s priority has always been her children and even more her grandchildren: Chelsie, Cole, Alaya, Joslyn, Alexandre, Maxim, Joséane, Carissa and Samantha. Kindhearted grandmother, she always had time for each of them and even welcomed her first great-grand-daughter Eleni on her birthday, June 22 and a second great-grand-daughter is awaited in December. On top of her unconditional love, donuts, pancakes, bread in oil, tourtières and fruit cake as well as the result of her crochet and weaving work have been given in large quantity to her offspring. Doris was a fighter, a peaceful strength who has paved the way for generations of women who have followed suit. Her commitment to her family and her community was at the core of her life. She was acknowledged by all as a proud, strong and reliable woman. She has worked with numerous local, regional and provincial organizations where she has never counted the time or the energy that she invested. She has, moreover, always wished for 36-hour days and more days in the week to be able to do everything that she wanted to. Earlton had 4 musketeers: Doris Thibodeau, Cécile Rivard, Rolande Gauthier and Lucille Robert. These women had a dream for their community and they created the Carrefour du Bel Âge. For more than 18 years, they served Meals on Wheels to elderly and underprivileged people while also creating a social environment for isolated people. This work lives on with Julie Laplante who is implementing various projects started with Doris. It was only one success among others. The province’s women have also benefited from Doris’s wisdom and strength of character as she has worked with various organizations among which l’Union culturelle des Franco-Ontariennes where she has held numerous positions including that of Provincial President twice. 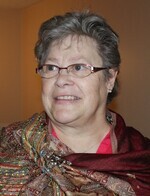 For this challenge, she associated with Guylaine Leclerc, who was her collaborator and friend. Doris was a beacon for those who wished to follow her. She had the ability to encourage women to take their place and to bring society to recognize the importance of women. A celebration will be held at 10 a.m., October 6, 2018, at St-Jean Baptiste church in Earlton. It is requested of the people who will join the family to wear something red as a souvenir of her favorite color and to bring a box of chocolates that will be shared in honor of this passion that was hers. The family would like to express their deep gratitude to their aunt Denise Gingras who was an anchor and a constant support both for Doris and themselves. Condolences, contributions and memorial candles may be left at www.buffamleveille.com.